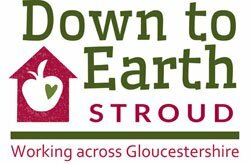 Down to Earth Stroud has a Service Level Agreement (SLA) with Stroud District Council to deliver a subsidised Gardening Assistance Scheme. In this scheme, council tenants who cannot maintain their own gardens because of ill health or old age, pay a small amount towards the work which the council subsidises creating an hourly rate for our gardeners. We currently have over 80 tenants on our books and have met some wonderful people. It’s been a great delight to be able to work with the council on this project, through which projects in other districts may have the opportunity to be developed. For example, we can work with tenants with communal grounds to create community allotments and if we find a bit of land they own that’s not being used for anything else, we can apply to set up either a community composting scheme, mini orchard or community growing space. The council were keen for a garden-share scheme to be developed and offered us the chance to set one up. Through both the council SLA and the private work, we have been able to engage 9 self-employed gardeners who work very hard throughout the year. Although this gardening work is not strictly within our remit, it has provided us with the opportunity to develop a relationship with our council (which has 3,800 gardens), provide self-employment opportunities and get to know the whole district!